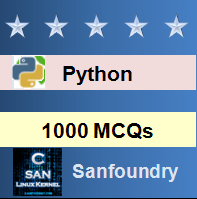 This set of Python Multiple Choice Questions & Answers (MCQs) focuses on “Variable Names”. 1. Is Python case sensitive when dealing with identifiers? Explanation: Case is always significant. 2. What is the maximum possible length of an identifier? Explanation: Identifiers can be of any length. 3. Which of the following is invalid? Explanation: All the statements will execute successfully but at the cost of reduced readability. 4. Which of the following is an invalid variable? Explanation: Variable names should not start with a number. 5. Why are local variable names beginning with an underscore discouraged? Explanation: As Python has no concept of private variables, leading underscores are used to indicate variables that must not be accessed from outside the class. 6. Which of the following is not a keyword? Explanation: eval can be used as a variable. Explanation: True, False and None are capitalized while the others are in lower case. 8. Which of the following is true for variable names in Python? Explanation: Variable names can be of any length. 9. Which of the following is an invalid statement? Explanation: Spaces are not allowed in variable names. 10. Which of the following cannot be a variable? Explanation: in is a keyword.